This image taken by NASA's Solar Dynamics Observatory watching the sun shows a powerful solar flare (center right) just minutes after it erupted on 6:20 p.m. EDT (2220 GMT) on Sept. 6, 2011. This story was updated at 8:48 p.m. EDT. Just as many Americans got back to work after the long Labor Day weekend, the sun jolted to life as well, unleashing a massive solar flare just one day after another sun storm sent a stream of particles racing toward Earth. 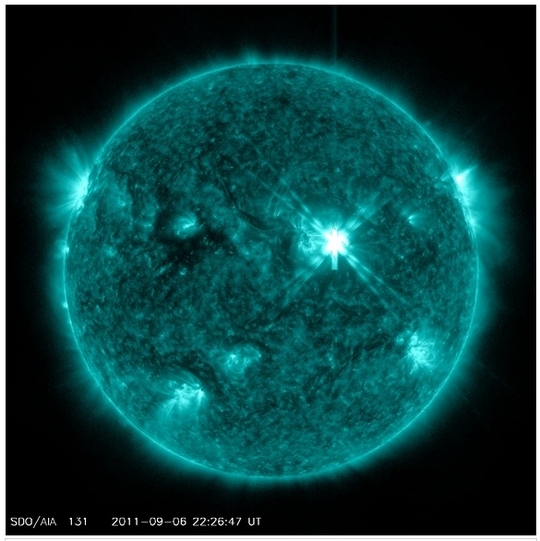 The X-class solar flare — the most powerful type of sun storm — erupted at 6:12 p.m. EDT (2212 GMT) on Tuesday (Sept. 6) and hit its peak strength eight minutes later, according to a space weather update by the National Oceanic and Atmospheric Administration (NOAA). The flare occurred less than 24 hours after another less intense but still dramatic solar storm. The Tuesday event registered as an X2.1-class solar flare, while Monday's storm topped out at a still-powerful M5, NOAA officials said. Strong solar flares are classified according to a three-tiered system: X-class flares are the most powerful, M-class are of medium strength and C-class are the weakest. Researchers are still taking the measure of the big Tuesday sun storm. It may also have produced a coronal mass ejection (CME) aimed at Earth, researchers said, but as of Tuesday evening it was too early to tell. Monday's event, which took place at 9:50 p.m. EDT (0150 GMT on Tuesday), did spawn a CME. It was a relatively slow one, traveling at less than 720,000 mph (1.2 million kph), NASA officials said. And even if this cloud of charged particles hits Earth in a few days' time, it likely won't cause much damage. "This CME is not expected to cause significant geomagnetic storm activity, and further analysis is currently underway to better refine the CME timing and magnitude," officials at NOAA's Space Weather Prediction Center wrote in an update Tuesday. Monday's M5 solar flare erupted from the middle of the sun's disk as seen from Earth's perspective. The explosion caused a slight increase in solar energetic protons about 26,000 miles (41,840 kilometers) above the Earth's surface, NASA officials said. The powerful storms unleashed on Monday and Tuesday aren't isolated incidents. Solar activity has been ramping up over the last few months as the sun has roused itself from an extended quiescent phase in its 11-year activity cycle. Just last month, for example, the sun let loose with an X6.9 solar flare, which was the most powerful solar storm since December 2006, NASA scientists said. That storm, which erupted Aug. 9, also generated a CME, but it was not aimed at Earth. Another powerful event, an X2.2-class flare, occurred on Feb. 15 of this year. Tuesday's X2.1 was the third most powerful flare of 2011. Scientists expect activity in the current cycle — known as Solar Cycle 24 — to peak around 2013.